This page is intended to help you get phonetic symbols into a word-processed document. 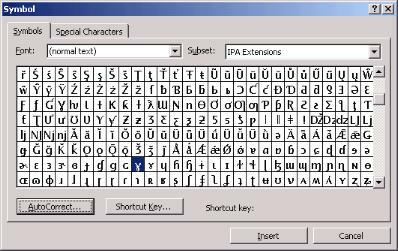 It is intended primarily for people running Word 97 or later under Windows 98 or later, using the Unicode phonetic symbol font routinely supplied by Microsoft. For other Office applications - Excel, Access, Powerpoint, Outlook, Outlook Express - see below. 1. Check that you have a phonetic font available. On UCL cluster installations, this means the font Lucida Sans Unicode. Open a blank document in Word. 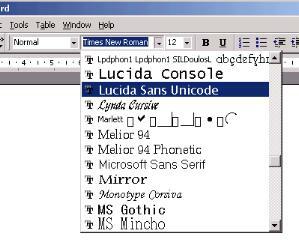 Click on the font box and select Lucida Sans Unicode from the drop-down menu. If you haven't already got this font installed, download it and install it. Alternatively, you may prefer to use some other Unicode phonetic font, e.g. 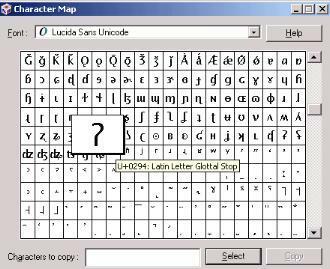 Arial Unicode MS, Charis SIL (download), Doulos SIL (download) or Gentium (download). NB. Most other fonts do not include phonetic symbols. There are several ways to do this. Choose the way you find easiest. (a) Copy and paste from the symbols below. Disadvantages: You need to keep this page on-screen. Some symbols are not shown here. and find the symbol in the drop-down box that appears. Advantages: Easy. You can even define a Shortcut Key for a symbol you need a lot. which you can launch from Start | Programs | Accessories | System Tools | Character Map. Remember to select the font Lucida Sans Unicode. Advantages: Gives a label for each character, helping you to be sure you've got the right one. Disadvantages: Even more fiddly. Doesn’t work in older versions of Windows. and create AutoCorrect shortcuts as described there. Advantages: Excellent if you need to use each phonetic symbol several times. Builds on (b) above. Disadvantages: Takes some time to set up. 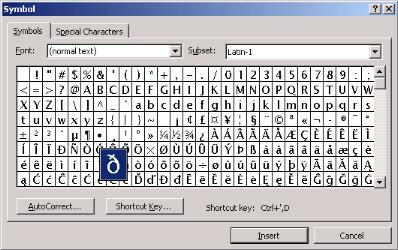 (e) In Word 2002, type the symbol's Unicode number and do Alt-x. Advantages: easy, if you know the number. Disadvantages: you need to know the number. Does not work with previous versions of Word. (f) Use a phonetic keyboard. Advantages: easy, using the chart supplied; does not require knowledge of Unicode numbers. Disadvantages: you have to toggle into and out of the special keyboard. Lucida Sans Unicode is a big font. If you mix it with other fonts it may disturb the line height. So if you want the rest to be in Times New Roman size 12, for example, set the Lucida Sans Unicode to size 10. With Times 10, use Lucida 8. 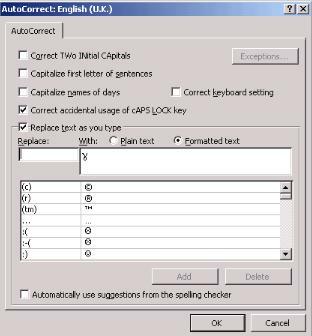 In Word, you should disable certain AutoCorrect functions that will otherwise automatically make undesirable symbol changes, notably the "correcting" of i to I (since you may want to use the phonetic symbol i on its own). Be careful over confusingly similar phonetic symbols. to use a virtual keyboard. This works with any Unicode-enabled application, but not of course with those that are not Unicode-compliant. Author: John Wells. My home page. Page created 2002 05 31. Last revised 2007 09 13.